Making software–any software, whether it’s an app on your phone to help you manage your finances or a game for the Playstation 4–is hard. Making good software that doesn’t drive your users nuts is harder because you have to pay attention to something called usability. People have brains, and brains have limits in how much they remember, what they notice, and how long they can pay attention; software is usable if it is designed in such a way that it conforms to those limits. Usable software is intuitive and effective for users to accomplish whatever task is at hand; unusable software is clunky, overly complicated, and confusing. Game studios employ a technique called playtests. 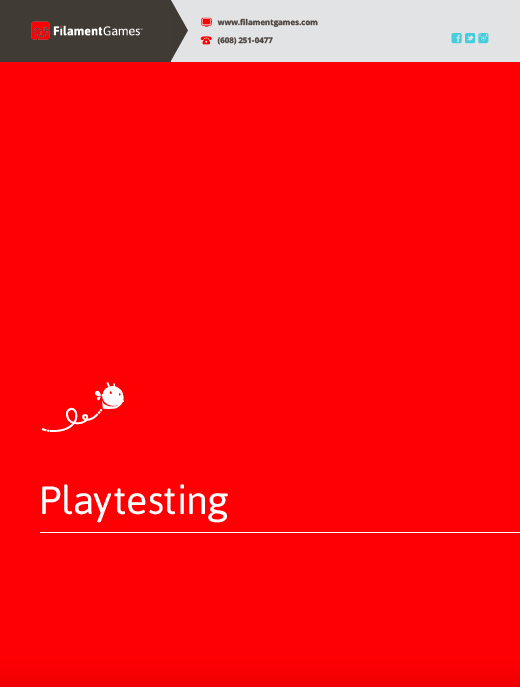 Playtests allow developers to test game usability–where are players getting stuck or frustrated?–in addition to finding out whether the game is fun to play. In Filament’s case, we also use playtests to measure the efficacy of our games as learning tools. This all sounds very complicated, but conducting playtests is fairly straightforward if you know the questions you’re trying to answer and have a plan in place. Download our free Playtest Guide for tips, tricks, and worksheets to make the most out of your playtests!